1. Prep: Section by section, spray PHYTO PROFESSIONAL WORKABLE HOLDING SPRAY from roots to ends and blow dry with T3 FEATHERWEIGHT LUXE 2I DRYER. The goal is to “over-dry” the hair for a fluffy, almost static-electricity texture. 2. Make a deep part in the hair on the right side, swooping the hair across the forehead. Add PHYTO PHYTOLAQUIE LIGHT HOLD HAIR SPRAY at the parting. Using it on just the part will give this element a super clean, graphic finish. 3. Some of the models were seen wearing a piece of white lace-inspired material, handcrafted by show stylist Victoria Simes- as you can see in the photos, those who wore one had it aligned at the part as an accent. 4. For the knot in the back, divide the hair into four quadrants. With the top section held apart, take the left and right sections and tie a knot. 5. After the knot is secure, drop the top section over the knot and tie another knot on top using the same right and left section ends to hold everything in place. 6. 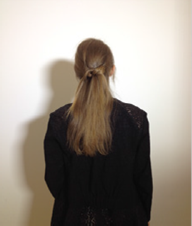 A stitch through the hair below the knot with elastic “thread” keeps movement minimal in the rest of the hair. 7. PHYTO PROFESSIONAL WORKABLE HOLDING SPRAY is then applied to finish the look.